Looks can be deceiving, is an old saying and my first reaction on looking at Virasat-e-Khalsa complex was, that it does not look anything like a museum of Sikh culture and history. 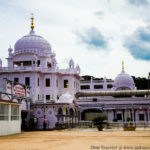 Only once you enter and reach the top-level after checking all the exhibits that you get a panoramic view of the complex and surroundings, by now you are already in awe of the exhibits and a short tour of the youngest and most reformist faith born in India. You will be forgiven to think initially that the design has nothing to do with local elements, as only while basking in December Punjabi Sun on the terrace, you notice the subtle elements from Indian ethos that are incorporated into the design and architecture of Virasat-e-Khalsa. The bland spires from outside when looked from the top-level of Virasat-e-Khalsa display shining metal petals that reflect the lights in the direction of Anandpur Sahib Gurudwara, one of the 5 holiest shrines of Sikhism. The Virasat-e-Khalsa complex is divided into 2 sections, with open spaces for exhibitions, an an amphitheater for cultural performances and water bodies that reflect surroundings and are an integral part of the complex. As we enter the main exhibit we are greeted by a huge mural that depicts life in a Punjab village from dawn to dusk. You watch the murals standing on a walkway that rises over the surroundings giving you a 360-degree view of the surrounding murals on the walls. The lights change color to showcase activities that start at the crack of the dawn till late in the night. Though I am not sure what theKhalsa is“SONY”, sign is doing in the village. Initially, I thought it was about the Japanese Electronics giant, but on closer inspection, it says” Cozy Innerwear”. Can you find Sony in the image above? I am not sure if this was needed. This first gallery exhibits life in a Punjabi village, as it has happened from time immemorial during peace time, for these fertile plains have been the battlegrounds of invading forces from the time of the Alexander the plunderer and later hordes from Central Asia to tribal Afghans. Peace has been a rare luxury here, yet each invasion had made the Punjabis more resilient and one of the bravest races in the world. The inner galleries that are housed in the petals visible from outside take you from Punjabi culture to the birth of Sikh faith with the preaching of the founder of Sikh faith Shree Guru Nanak Dev jee to the founding of Khalsa by Guru Gobind Singh. 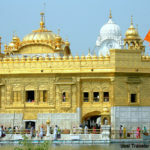 Here one must highlight the fact that Guru Nanak jee, was also one of the early travelers and during his long journeys on foot guru jee traveled far and wide to places both in India and abroad. He left his mark in places as far as Bidar in Karnataka, and all the way to Mecca in the Middle East. Finally, after his journeys guru jee settled in Kartarpur and shared his wisdom with his followers, these stories are depicted in form or murals in the gallery number 1 and 2 housed in the petals. As you walk you learn about the other Gurus in various galleries. Here I will like to highlight that you can listen to a sound show as you walk past each of the gallery. You can collect a small sound device with headphones at the entry of the first gallery. You can pick up your language to listen to the sound show from English, Punjabi and Hindi. The audio device gets activated automatically as per the gallery you are visiting and whispers the story of the era you are watching around you. The Virasat-e-Khalsa complex seems to be very popular among schools, colleges and both NRI and local communities. The current complex has history from the first Gurus time to the times of Guru Gobind Singh jee and formation of Khalsa faith. 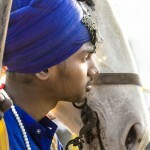 It is only after formation Khalsa that Sikhism as we see today with some of its traditions and rituals like wearing a turban on Kesh ( hair), carrying a comb, wearing a Katcha or underwear, wearing a Kada or metal bracelet and carrying a Kirpan ( a sword for protection of the faith and fellow citizens ). The best part of Sikh faith is that it is the only faith in the world that was born to protect another faith what is now known as Hinduism. Guru Gobind Singh started the tradition of each family making their first born Son a Sikh. Sikh word is derived from Siṣya or disciple in Sanskrit. Guru Gobind Singh enshrined the tradition of formal martial and scholarly training of the Sikh Soldiers, giving the birth of the concept of Sant-Sipahi or a Saint and Solider. Even today the Nihang Soldiers carry forward the tradition, though more in a ceremonial manner. Over all the Virasat-e-Khalsa complex is very well conceptualized and presented and it gives you a brief history of Sikh faith in a very pragmatic and scholarly manner. I think anybody with an interest in the history and diverse culture of India should visit the Virasat-e-Khalsa museum complex. 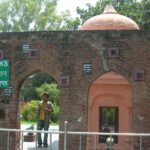 Virasat-e-Khalsa is the only museum of its kind in India that focuses on the teachings of the Sikh Gurus while simultaneously introducing you to the turbulent times, historical changes and social churning that happened in Punjab from the time of Guru Nanak Dev to the formation of Khalsa by Guru Gobind Singh jee. The museum authorities are working on the next phase that will carry forward the baton to the times of Maharaja Ranjit Singh till the partition of India at the time of Independence in 1947. No food, or beverages are allowed inside the galleries, but the complex has a cafeteria where you can buy snacks etc. Visiting hours of Virasat-e-Khalsa complex: Morning 10 am to 6 pm. Last entry at 5 pm. 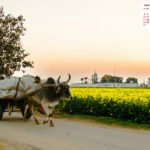 Location and how to reach: Virasat-e-Khalsa, Anandpur Sahib is about 80 KM from Chandigarh the nearest airport and major railway station. It is well-connected with good road network with all major cities and towns in Punjab. Photography: Photography is not allowed inside the complex, our host Punjab Tourism got us special permission for the same. Nice one Prasad sir. I missed many small things mentioned by you in the blog. When we went it was very crowded due to Hola Mohalla. I loved the architecture of the building especially the way it reflected in the pool. Wow, it is so beautiful from inside. We always go to Anandpur Sahib, but haven’t been inside it. Next time for sure. Yes, tempted to go inside now…it looks so stunning. Thanks Taya,… and welcome to desi Traveler…. Virasat-e-Khalsa looks like a bank of knowledge about Sikhs and Sikhism. The building looks fascinating too. Very interesting clicks and a piece of history as well.